Moscow’s newly acquired media muscle is able to effectively counter the barrage of Western propaganda and present the Russian side of the story to a global audience that simply loves it. The double-barrel crisis in Ukraine and Crimea has starkly revealed that news is no longer a Reuters, BBC, AP or Washington Post monopoly. The blitzkrieg of lies from the Western media was countered to a large extent by surprisingly slick Russian government media outlets that are winning friends and influencing people around the world. The Kremlin also found support among several influential allies, including former diplomats, independent journalists and the increasingly hard to ignore blogosphere. Princeton professor Stephen F. Cohen’s superb expose in The Nation of the “degradation of mainstream American press coverage of Russia” was, of course, the most retweeted, forwarded and reposted article in the Slavosphere. But there were several other commentators who refused to become stenographers for the White House. In the past, this negative portrayal of Russia was broadcast unopposed worldwide. Other than bias, there was a compelling reason. Media outlets around the world work on tight – sometimes heart stopping – deadlines. At such times, editors and producers tend to go for Western news agency copy because the likes of Reuters and AP are often the first to supply news and pictures. Few editors have the time to sift through the supplied text and – assuming that Western news reports will be of reasonable quality and authenticity – publish them without fact checking. This was standard practice at every newsroom this journalist worked. The upshot: slanted views, if any, are regurgitated for the consumption of audiences around the world. Lately, however, the global media’s centre of gravity has started shifting. 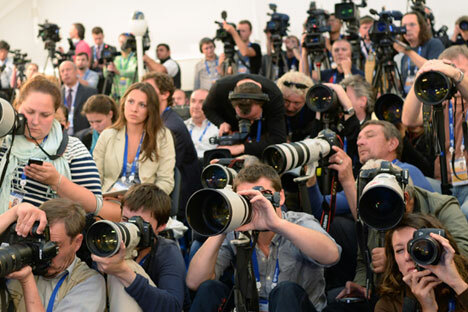 By nurturing news organisations that are able to offer the world an alternative to the Western narrative, Russia has achieved mission impossible. These outfits such as the RT television network and Rossiyskaya Gazeta’s Russia Beyond the Headlines, which this publication is a part of, have proved to be surprisingly popular, especially in the West. This is a commendable effort considering Russia’s population is only 150 million whereas China and India with billion-plus populations remain voiceless. Presenting round the clock news bulletins, documentaries, talk shows such as Larry King’s Politicking, and sports news, RT has grown to be a global media giant. In 2013 RT became the first TV news channel in history to reach one billion views on YouTube. It is now the second most watched foreign channel in the US after the BBC World Service. However, the overwhelming majority of readers are delightfully surprised by the sheer variety and vibrant content generated by RBTH mastheads catering to a global audience. The UPI’s Martin Walker says Putin is “a ruthless carnivore in a Europe of soft vegetarians. He is a ruthless rogue running an aggressive rogue state”. Clearly, this is not journalism; this is the perfect example of what George Orwell calls bad political writing stemming from “foolish thoughts”. Such hatred only blinds the Western public to the realities of the post-Western world. A quick online search reveals where Walker is coming from. The UPI is owned by the Unification Church which among other sordid things is known for supporting Richard Nixon during the Watergate crisis. Its late founder once said Jewish victims of the Holocaust were paying indemnity for the crucifixion of Jesus. To be sure, most Western journalists are capable of producing quality journalism. There is no doubting their talent or intent. The problem, however, is that like Walker, who is in hock to a fundamentalist church, they are tamed to serve corporate needs. Ironically, the media in the United States has come to resemble the state-run media of the old Soviet Union, rarely deviating from the policies laid down by corporate bosses like Rupert Murdoch and Jack Welch. Pulitzer Prize winning reporter Peter Arnett (CNN, MSNBC) and the legendary Phil Donahue (NBC) were both fired for their anti-war stance. Even the legendary Bob Woodward was part of the US media cheerleading crowd as George W. Bush talked war. On March 6, 2014 President Barack Obama passed an Executive Order which allows him the authority to seize the assets of any US citizen who directly or indirectly stands in the way of America’s Ukrainian policy. Journalists wanting to keep their jobs won’t be taking a punt on that order. In such a scenario Western journalists need our commiseration rather than contempt. They are working in a broken system while at the same time having to pay their bills and mortgages. You can add news networks to that list.